You are the light of the world … Let your light so shine before men, that they may see your good works and glorify your Father in heaven. Gather ’round, children. I want to tell you a story about a time long ago when most people didn’t have phones in their pockets or their purses. Instead, if you wanted to call someone, you had to use the big, bulky phone plugged into the wall in your kitchen. And if the power went out, you were stuck. Or you could always walk to their house, barefoot, uphill both ways, in the snow … the way we all walked to school. I actually did have a cell phone by this time, but Dave didn’t see the need. That all changed right after “the storm.” We have storms all the time in the Pacific Northwest, but this was one of the biggies. I was out running errands when it hit. I could tell it would be bad, because transformers were popping and all the traffic lights in town were out, but flailing back and forth like crazy. So I turned the car around and headed for home. But when I got to our driveway, I was stopped by a neighbor, who showed me the power line lying across our road. We are the very last people on our road, and to get there you have to go all the way down our potholed gravel road, then down a very steep hill, then across a walking trail, and back up into the woods. “You’ll have to try again later,” the neighbor said. Not knowing what else to do, I went down to Burger Mill and ordered a chocolate milk shake. That’s what you do in a crisis, right? And I wasn’t the only one who thought of Burger Mill. The place was full of storm refugees. I sat in a booth by myself and read a book I had with me. I called the neighbor (who also had a cell phone) after an hour, and then another hour after that. Both times he told me it still wasn’t safe to come home. I really, really wanted to be home. I love storms when I’m actually in my home, with the wood stove going and candles lit all over the place. And here I was, sitting among strangers, missing all that. Dave didn’t know where I was, and I couldn’t call him because our home phone didn’t work when the power was out. So I started thinking of a way to get to him and the kids. Behind and to the sides of our house are acres and acres of woods. But I knew a spot where the woods were a little less dense, and where I could park my car on a back road and try to walk in. 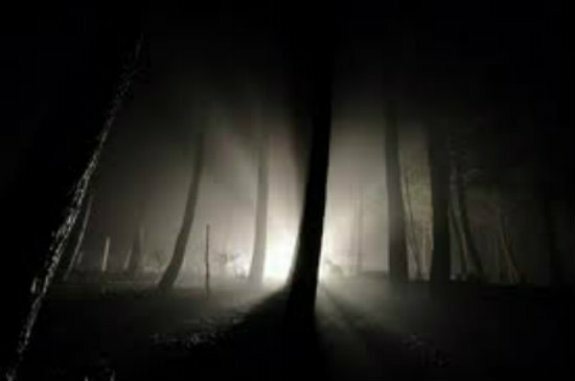 The problem was, those woods are treacherous if you don’t have light. Even from the safety of town, I knew those enormous evergreens would be bending and swaying, and dropping branches and limbs below. Add to that all the rabbit holes and fallen logs and it made for a walk you didn’t want to take in the dark. It occurred to me that I might make it if I stopped first at Fred Meyers (our grocery/department store) and bought a flashlight. So that’s what I did. And then I drove to a spot behind the woods, locked the car, and started making my way home. I knew the general direction of the house, but at first I couldn’t see anything at all in front of me except for those swaying trees and dropping limbs. I had to keep alternating between shining the light on the ground in front of my feet, and shining it upwards to make sure nothing was about to drop on me. And everywhere I went, there was an obstacle of some kind — logs to be scooched over, holes to be avoided, bushes and brambles to be dodged. I progressed in slow inches, to a soundtrack of groaning limbs and a howling wind. I could see my feet now, but I couldn’t be sure I was heading in the right direction. But after several long tense minutes, I finally saw a flicker of light beyond the trees. It wasn’t a big light, but it was enough to point me home. Several more minutes of dodging branches and avoiding rabbit holes and climbing up and over fallen logs, I came out into the clearing that is our back yard. And up the hill I could clearly see the kerosene lamp Dave had lit and set in the window. He didn’t even know I was out there, but he’d struck a match anyway. In the same way, you and I don’t know who is out there, stumbling around in this dark world, but watching the light that is you, and the light that is me. We’re not called to be a big light; we’re just called to keep our tiny light shining in the open, so that anyone looking will find it. As unbelievable as it seems, we broken vessels carry Christ within us. It is our privilege to let Him shine through us.